The majority of this 3cd set focuses on a mammoth Lovesexy tour rehearsal dating from the early stages of the rehearsals. The correct running order of the tracks presented on this set are highly questionable due to the fact a fair number of the tracks performed are incomplete and suddenly cut-out - most notably during Disc 1. The quality throughout the rehearsal is a superb soundboard recording, and even with the drop-outs it would be too harsh for me to criticise. Disc 1 begins with a loose warm-up based around 'The Payback' which contains as much chit-chat between Prince and the band members as it does music. The main topic of conversation appears to be Prince's knowledge of a number of band's on the UK music scene at the time along with his thoughts on Weird Al Yankovic's video for 'Fat'. Next up is an extremely lengthy 35 minute version of 'Alphabet St' which includes various band solo's along with a repeated phrase of "Let me feel u up". The following few numbers are mainly instrumental takes with emphasis on the band members getting things correct, with little worthy of note occurring. Track #8 listed by Sabotage as 'Instrumental' is the musical segue performed on the tour between 'Kiss' and 'Dance On' which in turn includes parts of Sheila E's drum solo. Prince is absent for the remainder of the rehearsal with Levi taking over vocals for the first take of 'When You Were Mine' before Boni and Sheila E decide to grab the mic action. From here on Sheila E appears to be calling the shots and does a mighty impressive job of keeping the band structured and focused. Disc 2 is a continuation of the rehearsal with many of the tracks being rehearsed several times - a prime example of this is 'Positivity' which lasts in excess of 34 minutes and includes at least 5 takes of the track. Prince returns to the rehearsal during 'Positivity' (he's absent during 'Superfunkycalifragisexy') however he stays only for part of the 'Positivity' rehearsal along with 'Anna Stesia' before he is off again. The band rehearse versions of 'Glam Slam' and 'Dance On' which are identical to the album tracks complete with lyrics which never made the version played on tour. It's slightly misleading for Sabotage to list 'The Cross' as being rehearsed as it is simply the closing brief musical portion rehearsed before launching in to 'I Wish U Heaven'. As with the previous disc, Disc 2 also contains a number of incomplete tracks and unfortunately has a few drop-outs throughout. Disc 3 contains the final part of the rehearsal and Prince is not present at all. Again Sheila E seems to be taking the lead, however a number of tracks feature Levi on vocals, including his own version of 'Bob George'. As before a number of the tracks consist of 2 or 3 different takes with most work being done on 'Superfunkycalifragisexy'. The rehearsal closes with Boni on vocals for a great version of 'Chain Of Fools'. 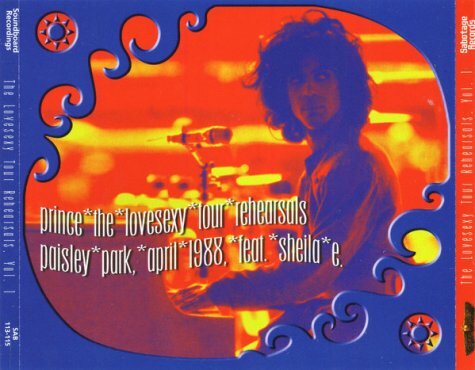 Ironically the part of the rehearsal on Disc 3 is the most complete of the 3 discs, yet it is the one on which Prince is not in attendance - shame. This is undoubtedly a fascinating rehearsal with many vastly different versions of songs in comparison to the versions which would later make it on to the actual tour. The real let-down is that Prince is not present for over 50% of the rehearsal. Add to that the number of drop-outs and incomplete tracks, and it's perfectly understandable why some people do not rate this rehearsal. The quality of the soundboard is it's saving grace, and is hard to find fault with. The second half of Disc 3 contains a much later rehearsal dating from summer 1988 a matter of weeks before the tour takes place. The sound quality is slightly more gritty and lacking the depth of the previous rehearsal, however again it is of very high quality. It is a basic run through of the show and all tracks rehearsed are played as they are on the tour. Both 'Bob George' and 'Anna Stesia' are heavily incomplete (Bob George lasts barely 1 minute in length), however a more complete version of the rehearsal is available on Sabotage's later release 'Lovesexy Tour Rehearsals Volume 2', so the inclusion of this tiny part of the rehearsal on this disc is baffling. Overall this is a great document in preparation for the Lovesexy tour, although certainly no match for the sublime 'Lovesexy Tour Rehearsals Volume 2' release. The sound quality is of a consistently high quality, and the content is interesting and extremely enjoyable. The first rehearsal is slightly disappointing due to the lack of Prince's presence, however the band's performance is commendable when the master is not around. The merits of bootlegs become very clear when you play this set - it's classic rehearsal material of a kind Prince would never consider releasing. The April rehearsal opens with Prince talking to the band members over a loose arrangement of James Brown's 'The payback' before launching into a 40+ minute version of 'Alphabet St.' that more often than not goes off at a tangent. 'Positivity' on disc 2 is also long, around 35 minutes, and features take after take of the song. And to think that after all that effort the song was dropped from the Lovesexy set after only a few shows... 'I wish U heaven' is another highlight as it extends into an instrumental 'Take this beat' and beyond. If you have space for a 3CD set in your shelves this wouldn't be a bad choice to fill it.